Wayne Heller is to appear before the New Smyrna Beach council on September 11 to address concerns regarding his proposed purchase and relocation of the historic steamboat Delta Queen. Many steamboat fans are hopeful that the historica boat will remain safely away from hurricanes and salt water and continue to reside at its current picturesque home in downtown Chattanooga, TN where it is lovingly cared for by Leah Ann and Randy Ingram and open as a hotel, restaurant, lounge, and event facility. The City Commission members of New Smyrna Beach, Florida accepting input regarding the potential relocation of the Delta Queen. They meet to further discuss this matter on Tuesday, April 10, 2012. They hope to tow the 84-year-old National Historic Landmark by June 1 (Daytona Beach News Journal: March 27, 2012) to the Atlantic Ocean side of Florida to New Smyrna Beach, located south of Daytona Beach, where it would flank the Heller’s Riverview Hotel. This would remove the vessel from its current home along the Tennessee River in downtown Chattanooga, Tennessee where it operates as a hotel, restaurant, lounge, special event facility and live entertainment venue. It’s removal would separate the historic vessel from the river system it has cruised since 1947. Relocating the Delta Queen would require the fragile wooden vessel to endure a long ocean voyage to east Florida where the boat would float in salt water and be at risk of enduring hurricanes. Awesome New Year’s Eve weekend! Wow! We had such an amazing weekend performing aboard the Delta Queen for New Year’s Eve weekend. 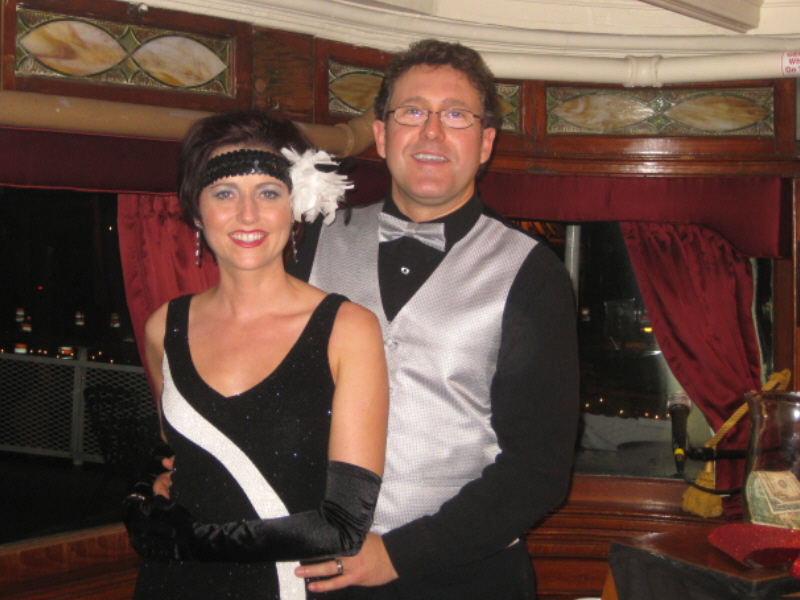 The Delta Queen team was at the top of their game for the huge boat-wide New Year’s Eve party. Special kudos to Hotel Manager Lloyd, Chef Joyce, and of course operators Leah Ann and Randy Ingram. The New Year’s Eve event was marketed as a private event package including hotel stay, DJ and dancing down in the Orleans Room, Laura and I having a blast with the crowd in the Texas Lounge, and Joyce’s amazing food stations scattered downstairs, all along the Forward Cabin Lounge, and up in the Texas Lounge. What an amazing buffet! 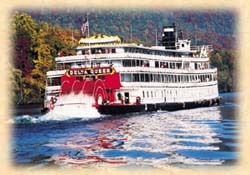 Thanks so much to the wonderful guests that supported the Delta Queen by ringing in 2012 with us. We had so much fun with you and look forward to the next time we can all enjoy an evening together aboard the legendary Delta Queen. 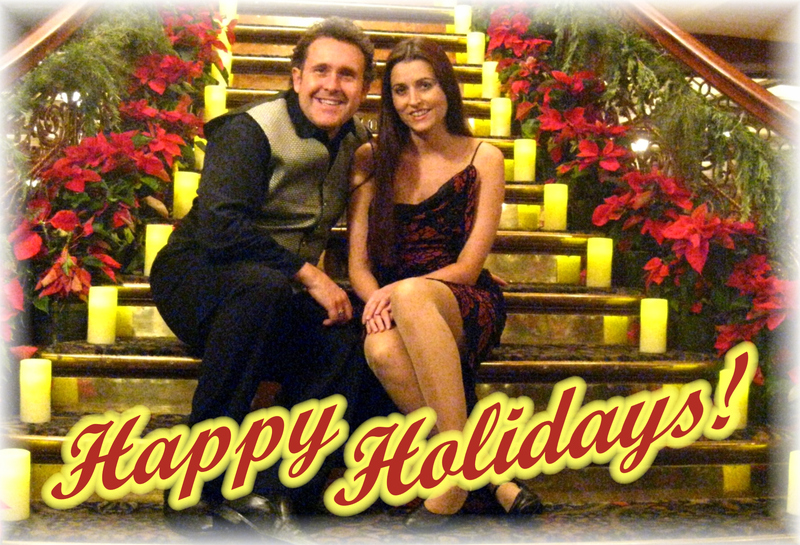 Laura and I have had such a great time performing on the Delta Queen for all the holiday parties, events, and festivities since Thanksgiving. What a wonderful place to spend a holiday getaway. Put it on your calendar for next year. The boat was decorated beautifully, and with all the poinsettias along the Grand Staircase, we thought it would make a perfect holiday card photo (see below). We hope to be back on the boat soon, but until then we wish you all the best and a very Happy Holiday. A city that can build an aquarium, save a century-old bridge, and restore a deserted downtown and riverfront to the level of global recognition, can surely save a riverboat. I understand the Delta Queen is priced at $4.75 million, which is a lot of money, but it’s only a pittance to what Chattanoogans have raised before. When you consider the accomplishments of the last two decades, this should be chump change to us. A shimmering jewel of history is in our midst, and we have one chance to permanently rescue this world-renowned vessel. Thank you to Leah Ann and Randy Ingram, current operators of the Delta Queen Hotel, for your vision in establishing the Delta Queen Preservation Foundation. I hope Chattanoogans will support this effort, including the “Rally on the River” fundraiser on Tuesday, Nov. 4.